Elon Musk unveiled his master plan for Tesla Motors Inc., delivering a long-term vision that includes making an integrated solar and battery storage system and building a freight truck and a bus. He even has a plan for a ride-sharing business. Musk delivered the long-awaited plan on the companys website to explain why the integration of Tesla and SolarCity Corp. is necessary and to show his vision for the two companies. He wants to use SolarCity, a rooftop solar panel installer, to generate electricity and charge an expanding range of Tesla models that address personal and public transport as well as cargo shipping. Analysts are skeptical about Teslas ability to add more products to its lineup. As is typical, Elon Musk has laid out a grandiose plan for the future with no timeframes and few specifics, and no mention of how and when Tesla will be profitable, Michelle Krebs, an analyst for Autotrader.com Inc., said in a e-mail. Teslas latest Master Plan includes expanding its electric vehicle product line to cover all major segments, when it hasnt been meeting production targets with the limited product line it has now and in the next couple of years. Tesla shares plunged more than 10 percent when the SolarCity acquisition proposal was first announced June 21. Analysts criticized the deal, pointing that Musk is the chairman and largest shareholder of both companies. We believe investors are likely to view this transaction as a bailout for SolarCity and a distraction to Teslas own production hurdles, Oppenheimer & Co. analyst Colin Rusch said in a note after the announcement. Teslas share price has since more than recovered the losses, closing at $228.38 a share Wednesday. A customer using Teslas Autopilot driver-assist technology was killed in a horrific Florida crash, prompting an investigation by the National Highway Traffic and Safety Administration. The Securities and Exchange Commission may also investigate the company for not disclosing the crash before its secondary stock offering in May, the Wall Street Journal said this month. Musk had a top executive defect to Facebook and missed his last two quarterly sales targets. 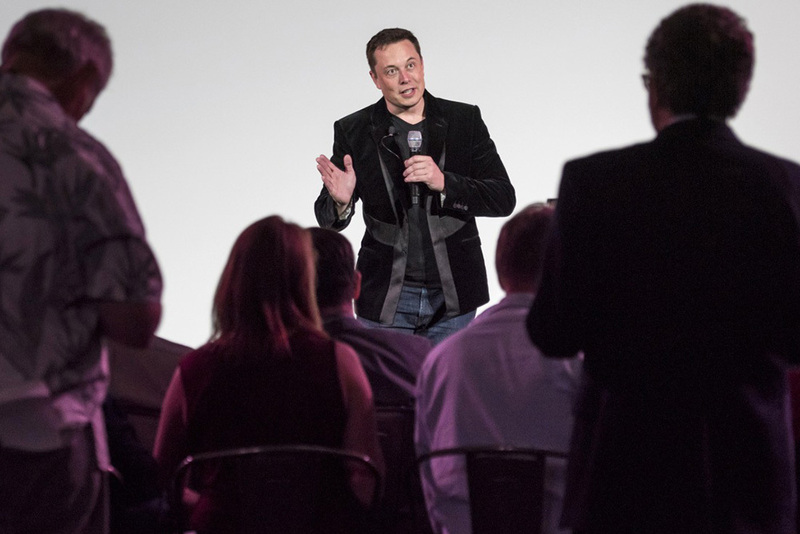 Musks call to expand Teslas business beyond passenger cars amid these challenges is the latest brash proposal from an executive known for his unconventional approach to the automotive and energy businesses. Musk first tweeted that he was working on a master plan July 10. Since then, he has tantalized his more than 4 million Twitter followers with tidbits about his progress and distractions, even joking about smoking crack. “Finishing off the plan while listening to the soundtrack from Gatsby. Seems appropriate,” Musk tweeted Wednesday. Tesla is best known for the electric cars and energy storage products it builds in factories in Fremont, California and Tilburg, Netherlands. Musk is adding a new battery plant in a partnership with Panasonic, east of Reno, Nevada. The so-called “gigafactory” is key to driving down battery costs for both the forthcoming Model 3 sedan, which is slated to start at $35,000 before incentives, as well as the Tesla Energy line of storage products for homes, businesses and utilities that were announced with great fanfare over a year ago. This is Musks second “master plan.” The original Secret Tesla Motors Master Plan published in August 2006 laid out the Palo Alto, California-based companys rationale for building increasingly affordable electric cars while also providing zero-emission electric-power generation options. In the 10 years since then, Tesla has largely stuck to its plan with the Roadster, the Model S sedan, the Model X sport utility vehicle and the forthcoming, smaller Model 3. Since its 2010 initial public offering, the company has reached a stock market value of more than $30 billion but only reported one quarterly profit and has about $2.5 billion in long-term debt.